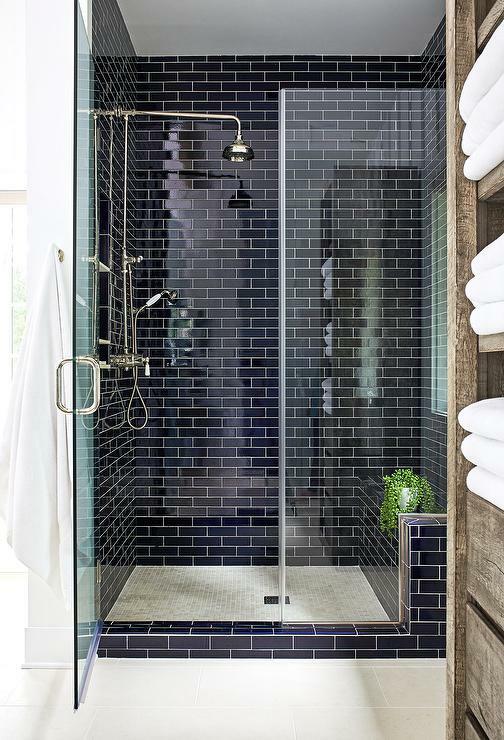 Last year, when I toured the SLC Parade of Homes, I noticed a trend that I really fell in love with instantly; navy tile. 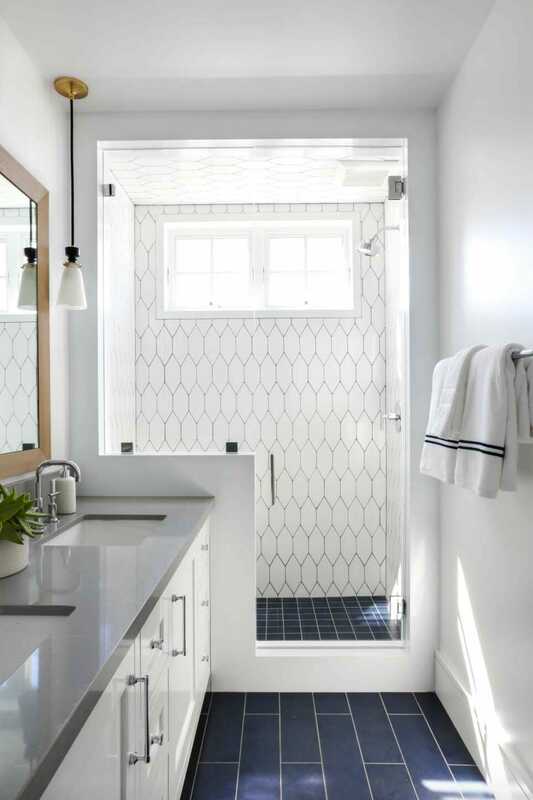 Since then, I have seen several more projects incorporating navy tile and I wanted to share the beautiful possibilities with you guys today and show you just want navy surprisingly can do in a space. 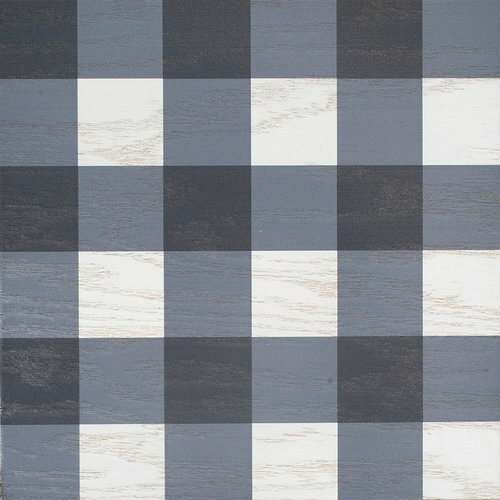 I also am sharing some fantastic sources for purchasing navy tile both in solid and patterns. 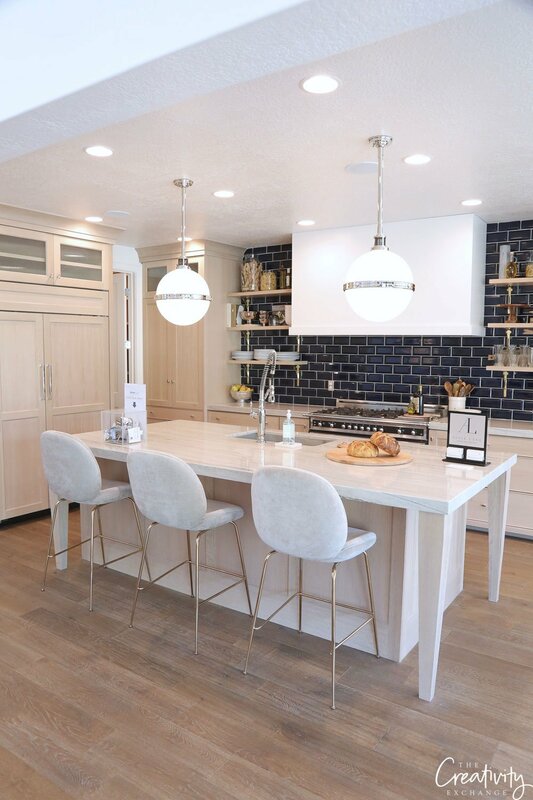 During last year’s SLC Parade of Homes, we were so inspired by the gorgeous navy tile in the kitchen of the Brinton Home, which was built by Ivory Homes and designed by Alice Lane Interiors. 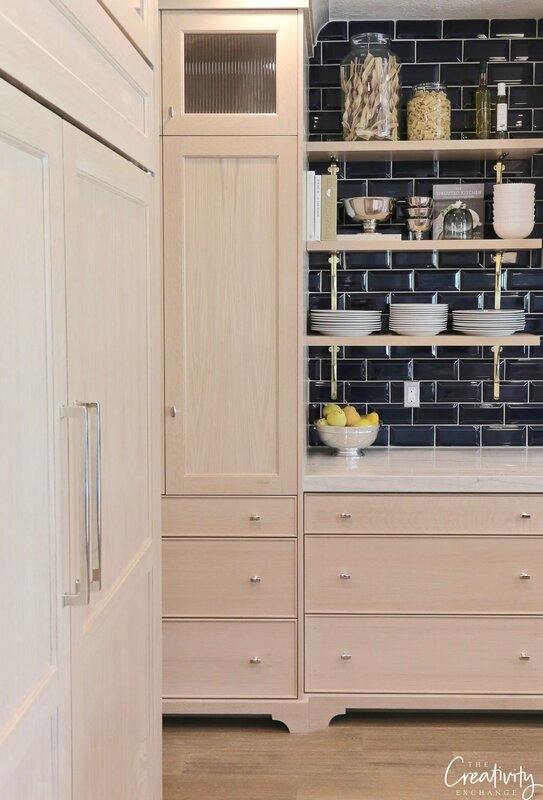 Really, the unexpected navy in the kitchen took our breath away mixed with the lighter wood tones. 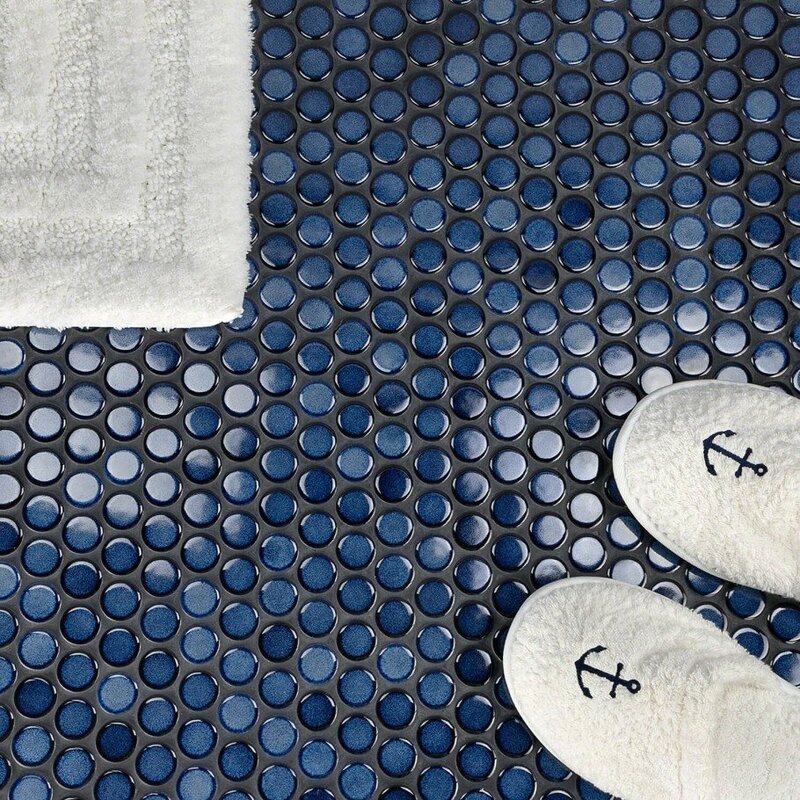 Prior to seeing the navy in the Brinton home, if someone told me they were doing navy tile in their kitchen, I’m not sure I could envision it. 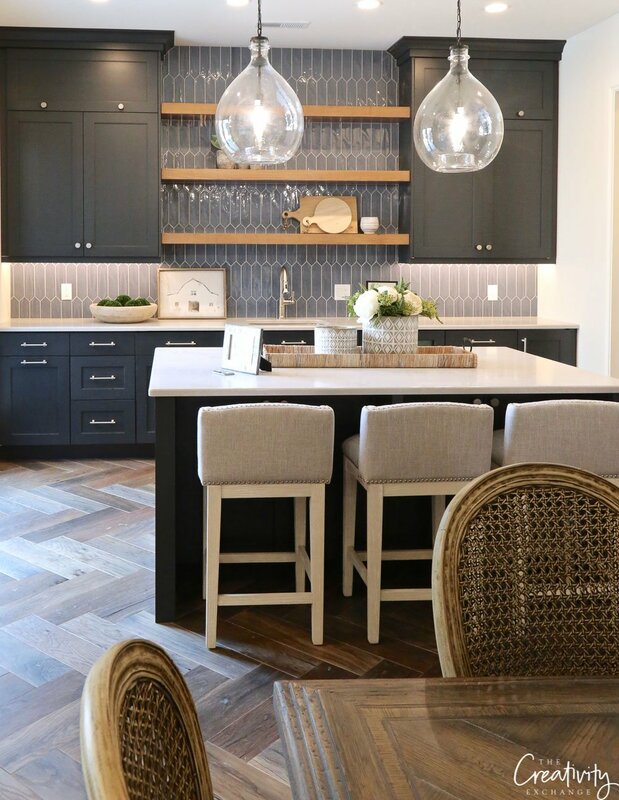 However, after seeing it in person, it really makes a lot of sense as a stunning backsplash when mixed with natural wood tones, beautiful metal finishes and modern lighting. 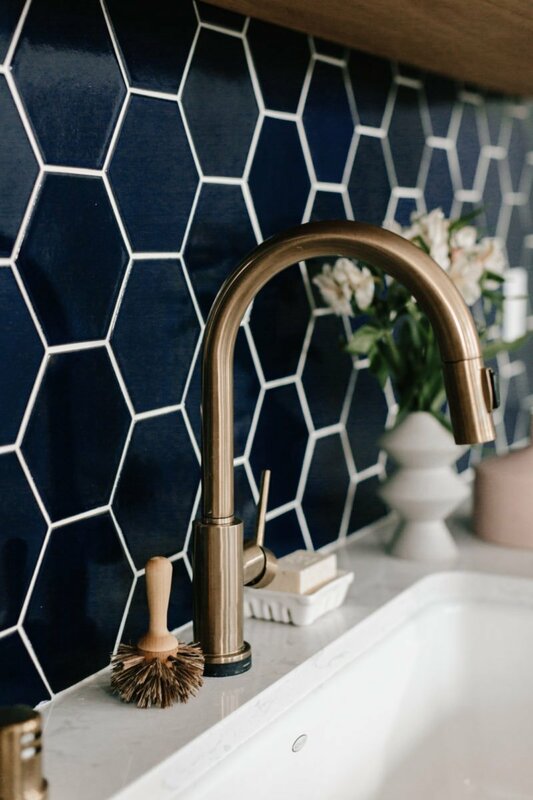 I love the hexagon navy tile below mixed with a brass faucet! The combination is so beautiful! 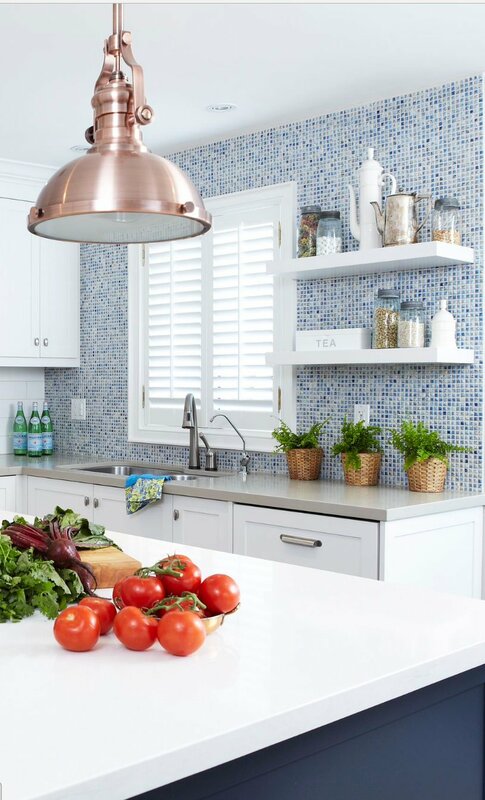 For those wanting to keep the kitchen light but still incorporate touches of navy, mosaic tile with pops of navy and lighter blue is also a pretty combination. 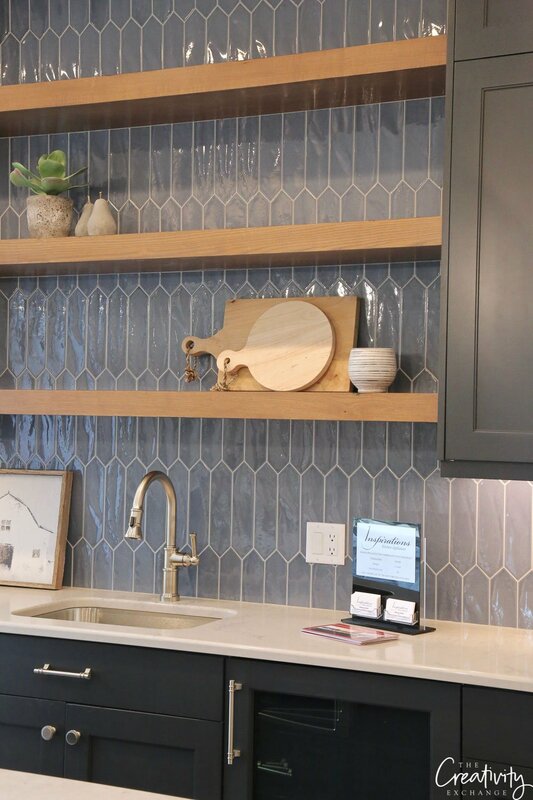 Also during the SLC Parade of Homes, I spotted another gorgeous navy tile backsplash the basement kitchen of the Bradshaw Homes and Properties ,designed by The Black Goose Design. 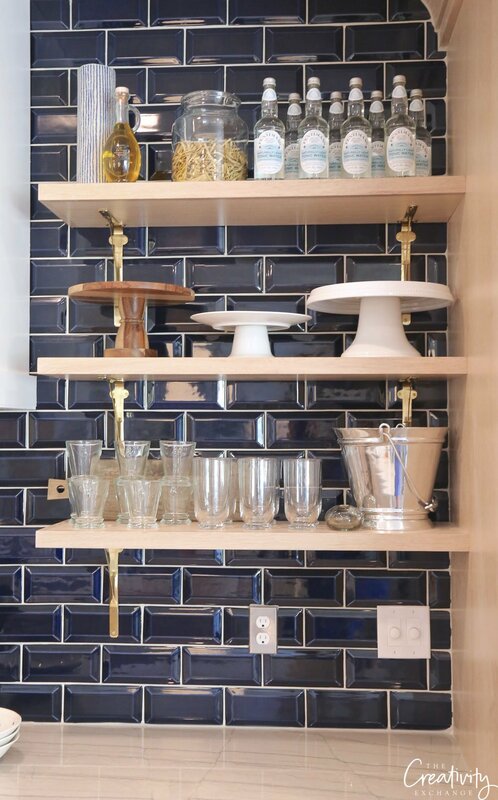 This home also mixed the navy tile with open floating shelves and the combination was so pretty and dramatic. 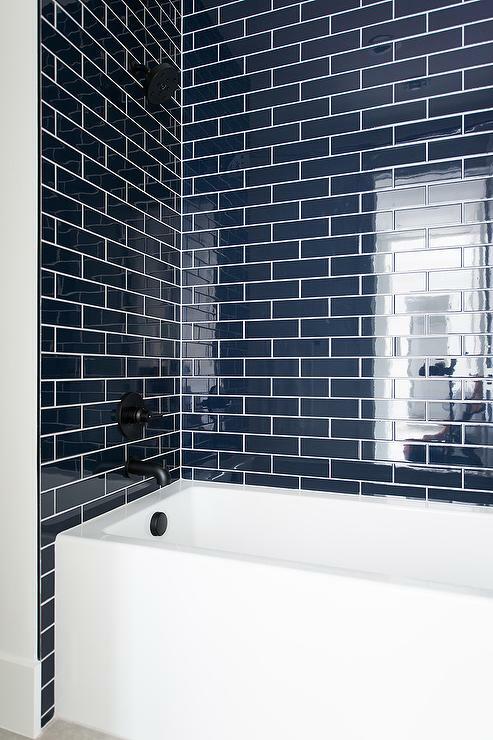 I’m also seeing a lot of navy tile in bathrooms with a modern twist and I am really inspired by the possibilities and combinations. 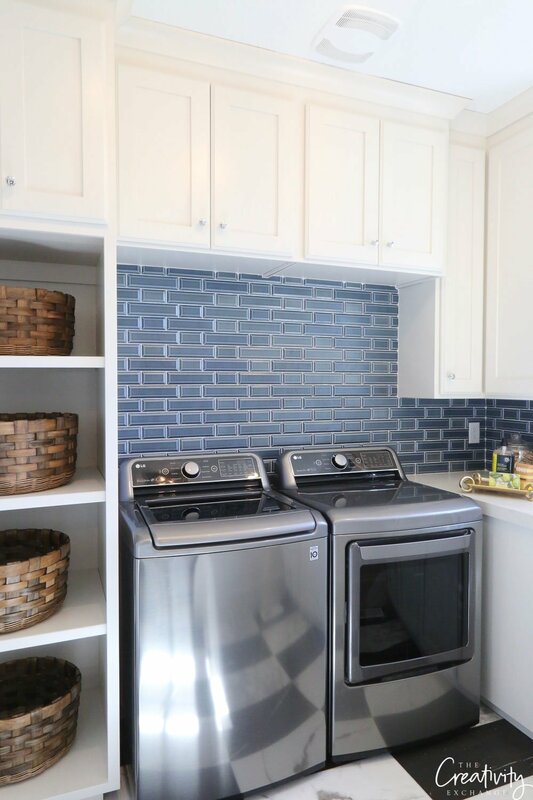 I was so inspired by the navy tile in the laundry room of one of the homes in the Utah Valley Parade of homes designed by Brandalyn Dennis and built by Arive Homes. 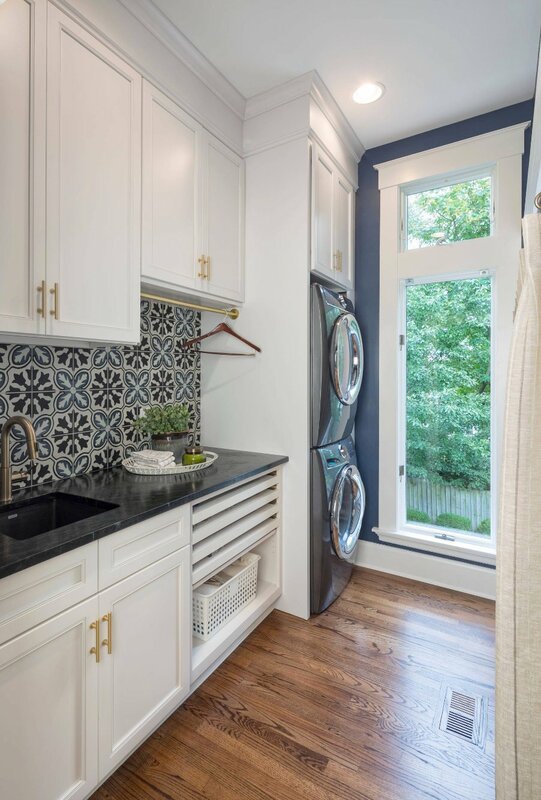 The mix of creamy cabinetry with navy subway backsplash was a great way to turn an otherwise standard laundry space into something so stunning! 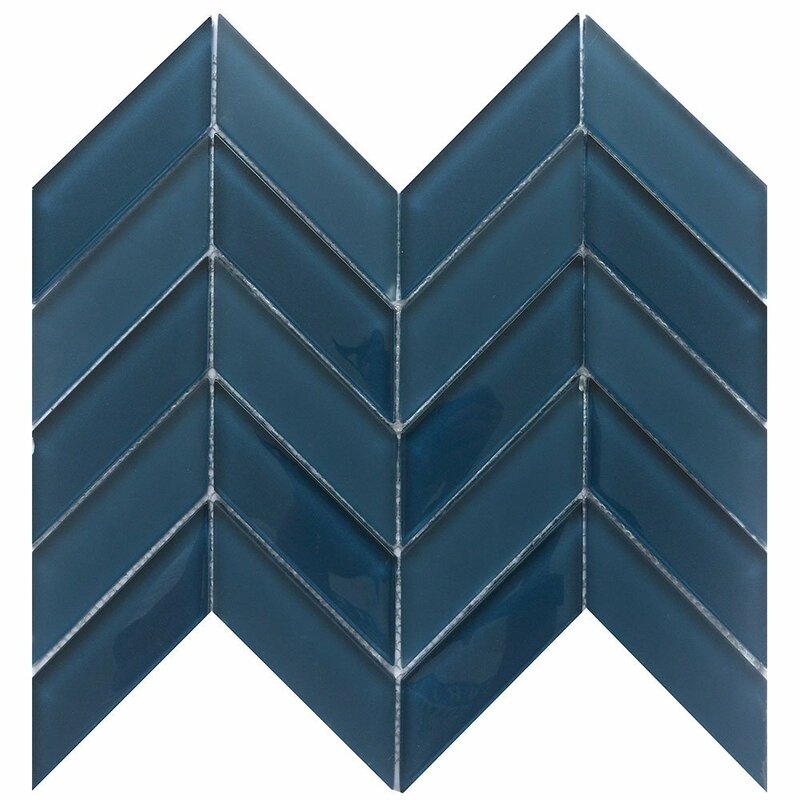 An alternative to navy blue tile is a lighter shade of blue. 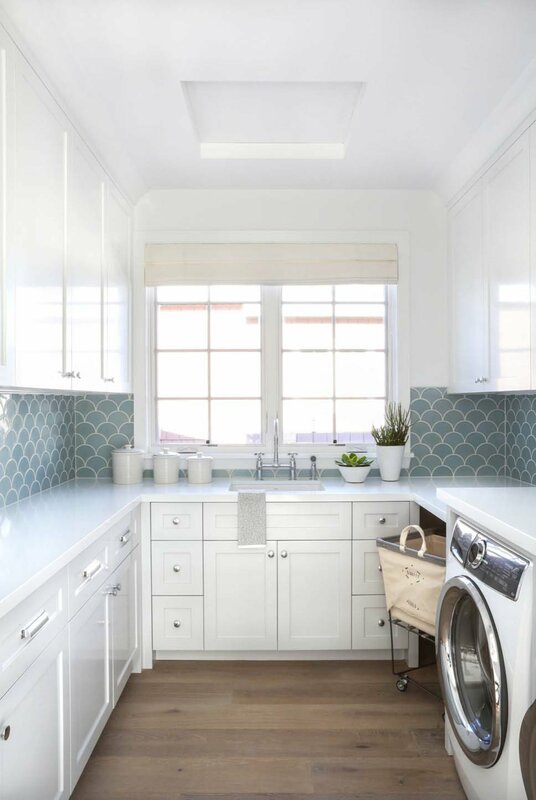 The lighter blue backsplash mixed with this all white laundry room is a great way to add contrast and interest. I really love this mix below! 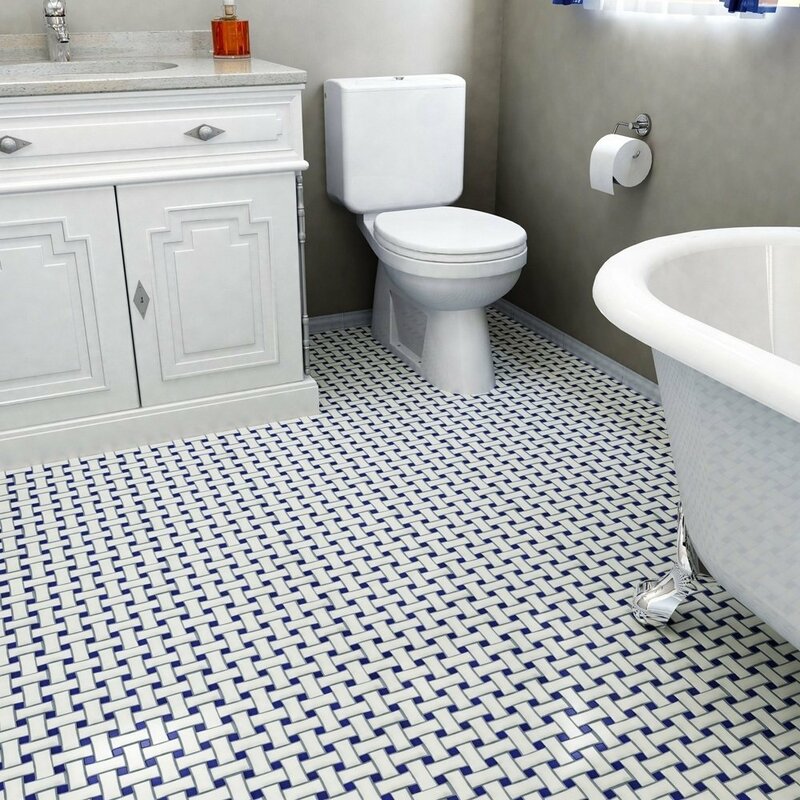 Navy patterned tile is another option and today, there are so many beautiful patterns and options. 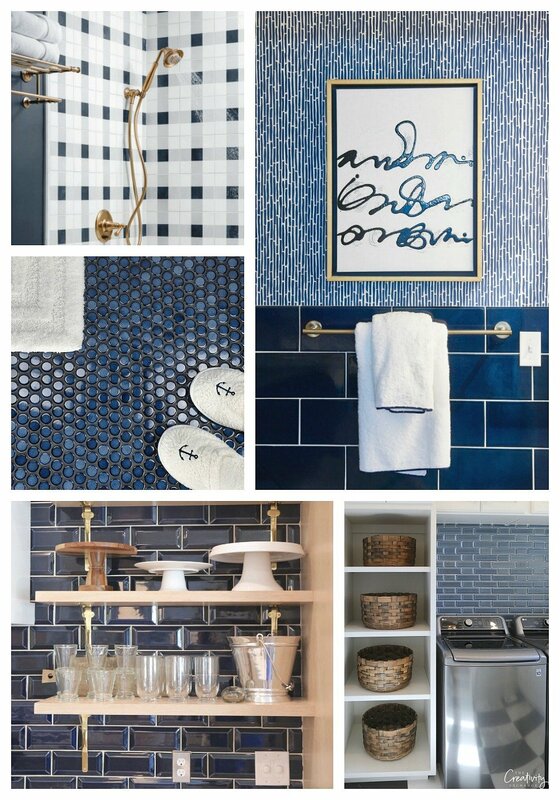 The possibilities are endless when it comes to navy tile. You can find so many fantastic options. Below are a few of my favorites. 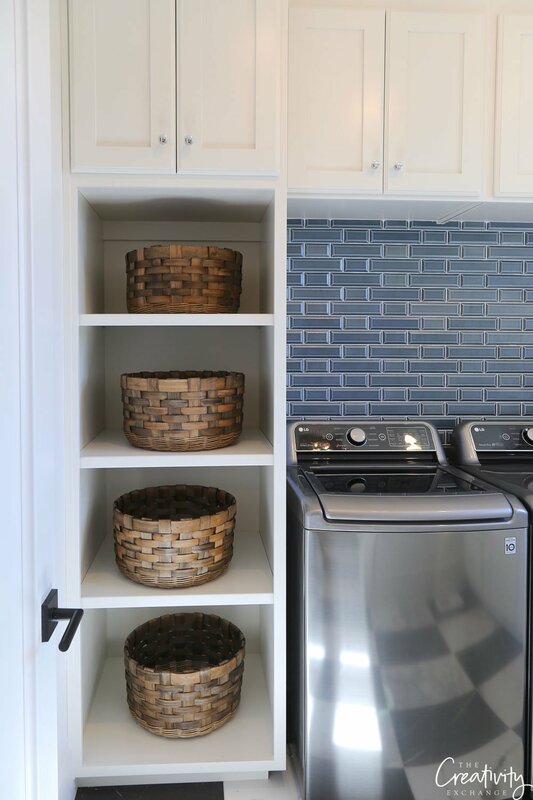 Navy and white basket weave tile. 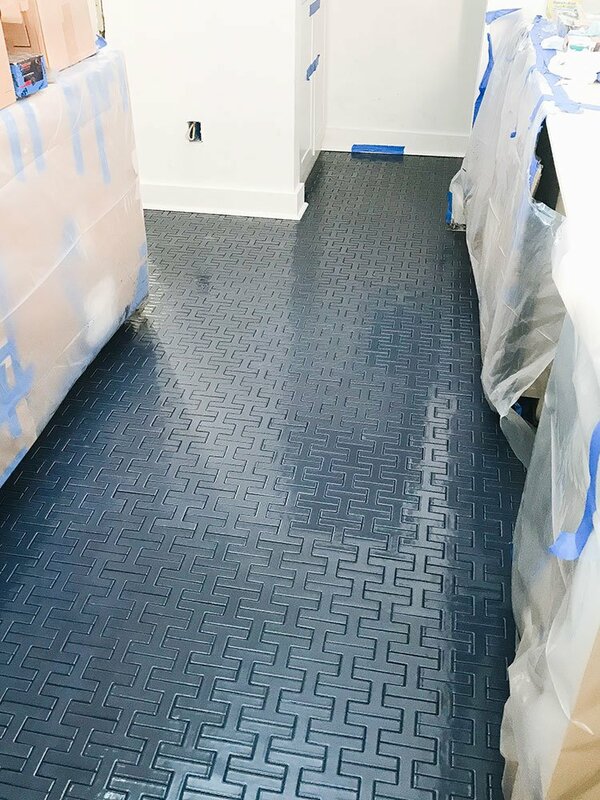 On a side note, as I was doing my research for navy tile, I ran across a gorgeous navy buffalo plaid wood floor tile that I wanted to include in this post because it’s just so fabulous!! 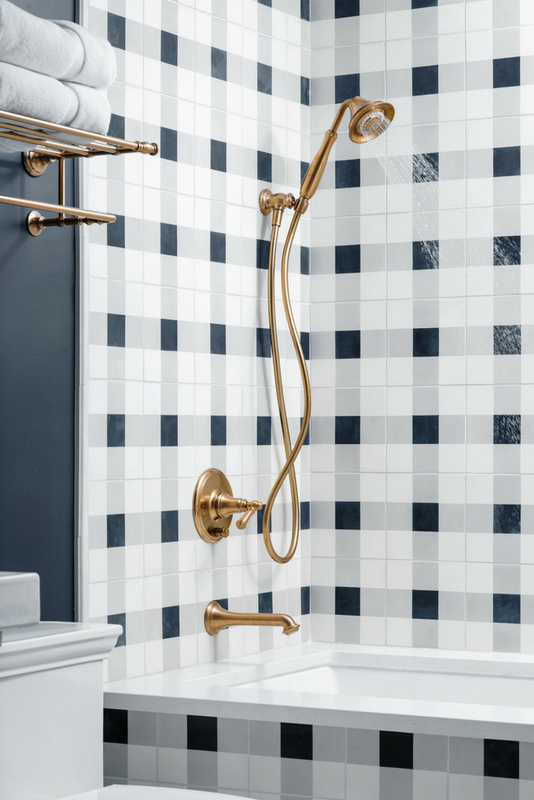 I can’t wait to continue to watch this navy tile trend continue to unfold and I am just loving the combinations that I have been seeing so far. What do you think? 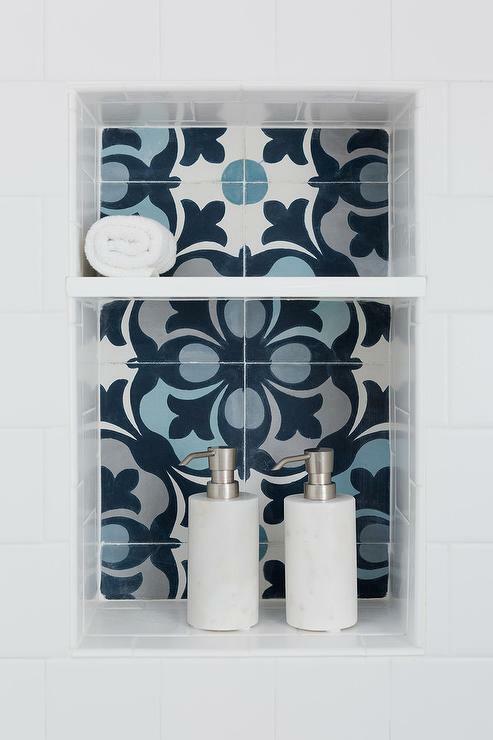 Can you see yourself adding a little pop of blue somewhere in your home? Wow and yes I can!!! See myself doing some of those . 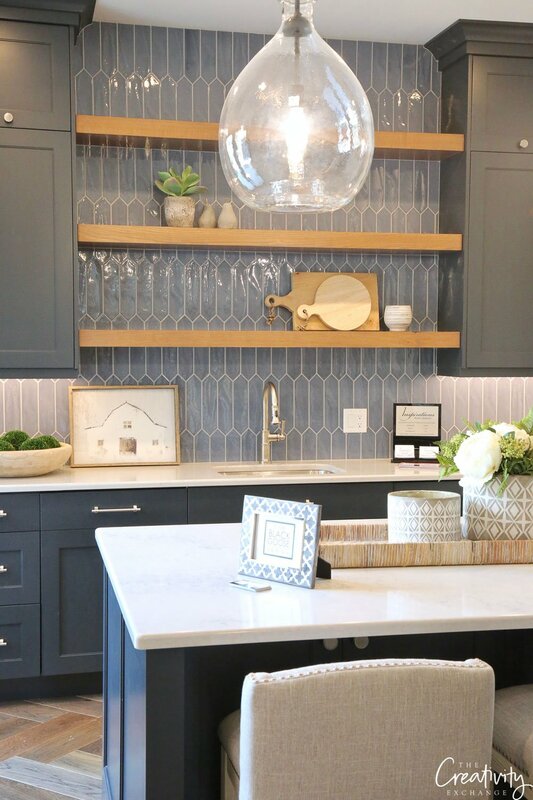 Loved that hexagon back splash . I have grown to love Navy blue ..
It’s so sharpe with almost anything .. I also love it used with seascape colors . 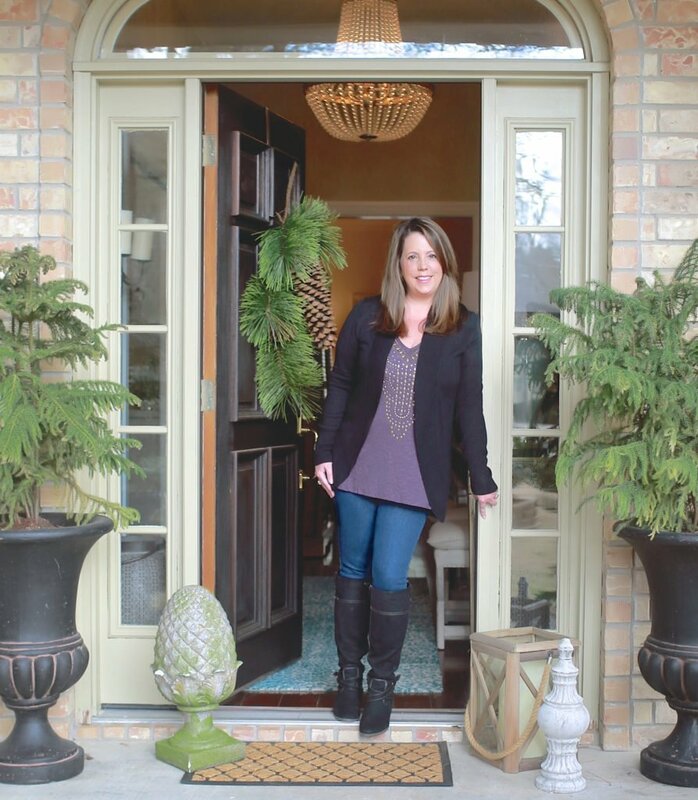 It’s so interesting seeing where and how color is now being incorporated and used in homes . It’s all about color right now . I love how I’m seeing it combined and used in such interesting ways . I’m normally pretty monotone but I’m enjpying some color these days myself . Thanks Enjoyed all the pictures !! 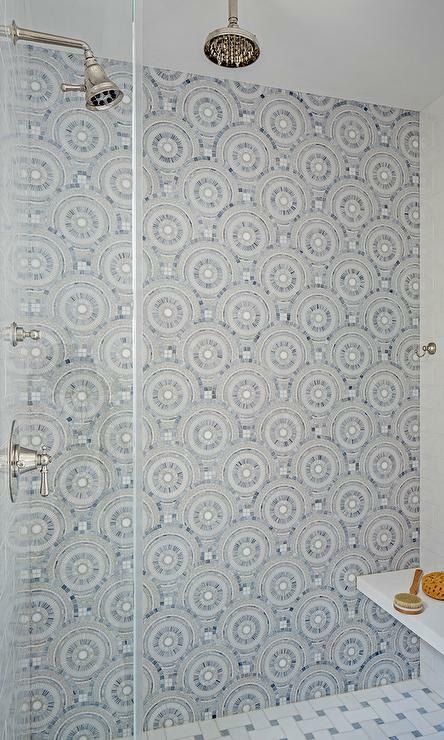 Hi Cyndy- we recently added a backsplash in our master bath using navy penny tile and it turned out beautifully! I chose it because I loved it, but it’s fun to hear that I’m ‘on trend’ as well. 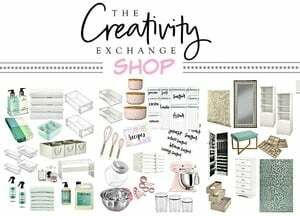 I enjoy your blog and website. Thanks for the beautiful content. Keen observation & such beautiful spaces you shared to demonstrate. I thoroughly enjoyed this post. 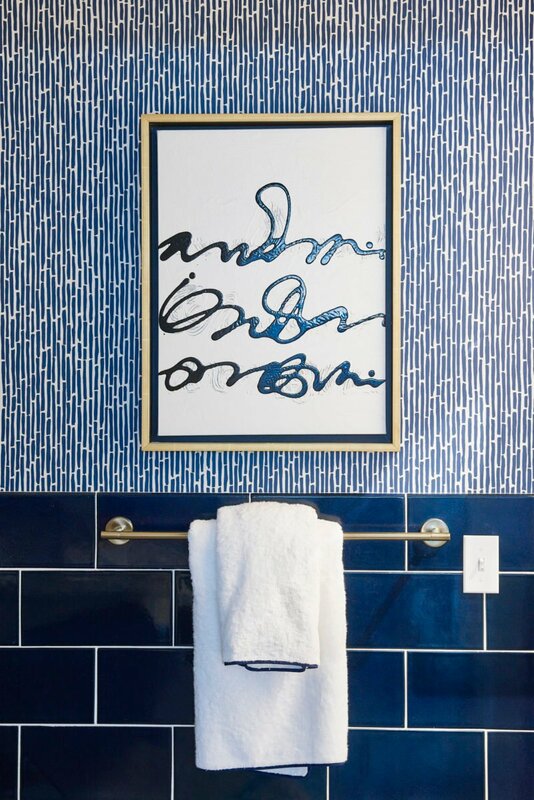 You have me considering navy for a kids bath remodel I am working on. Thank you.